Sometimes it can be tricky to inject colour into your house, and then it can be even trickier to decide what colours to go with that colour! When you walk into the DIY shop to look at paint colours and your greeted with walls and walls of different shades of cream, it is a complete minefield. 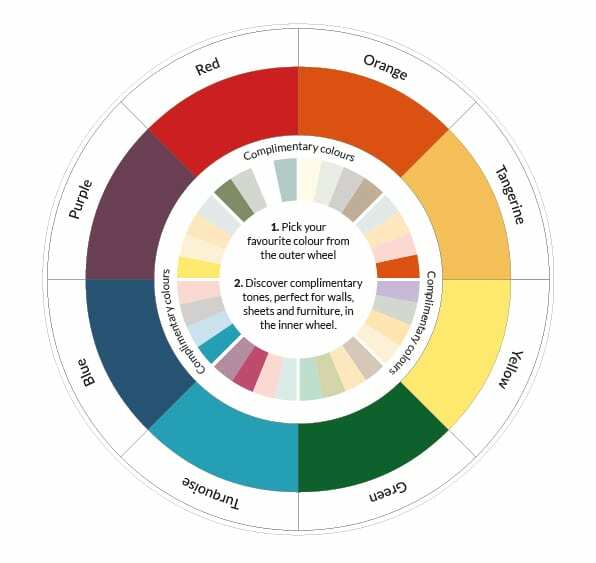 So George has come up with a handy colour selector wheel to help guide you on colours that work. On the article George also talk about colours for bedrooms and the colours you could use, passionate reds, energetic orange and clean greens. Then use the wheel to see which colours would work for your bedroom. I decided to use the wheel to pick out some accessories for our lounge. My twins are always choosing to sit on any old step or stool they can find, so they can sit nearer to the TV, apparently they can’t see the little bricks when playing Minecraft! However these little steps do not match my colour scheme and can’t be very comfortable either. So I was on the look out for some pouffes for them to sit on instead. I picked out the main colours Turquoise and Tangerine from the colour wheel, as I have Turquoise on the wall and Tangerine/Yellow in the curtains and cushions on the sofa. The wheel suggested I had light blues, which would work nicely in my room. 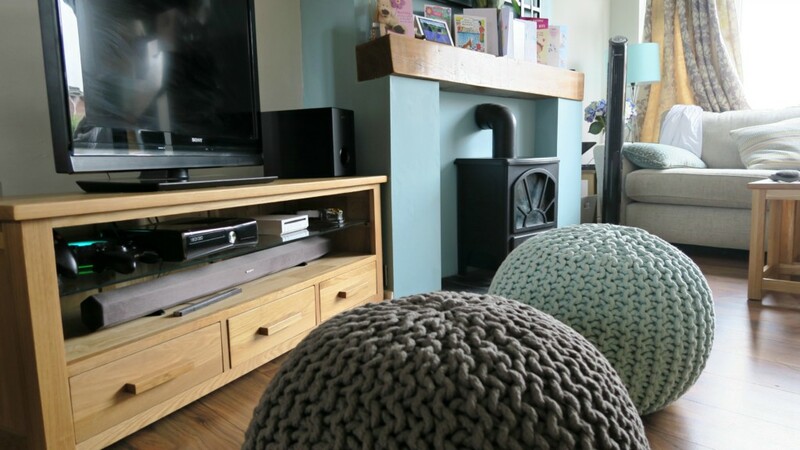 I picked out 2 knitted pouffes, one duck egg blue pouffe to give me the light blue, but I also choose a charcoal pouffe, as I have a little of this dark colour in my curtains which I wanted to pick out. These were priced at £39, with either free click and collect service or home delivery from £2.95. These have gone down a treat in our house, the girls are always using them but we love them too. They are great for extra seating when we have visitors, and putting our feet up in the evening. 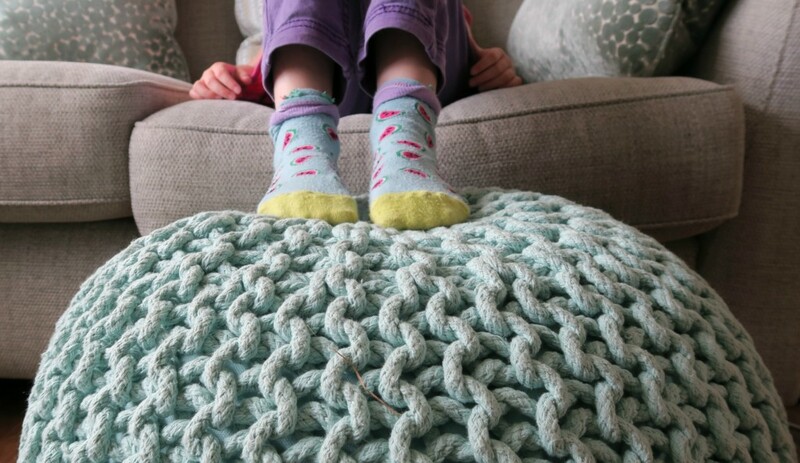 They soften once you start using them, and flatten a bit but as they are full of bean bag balls you can easily fluff them back up again. 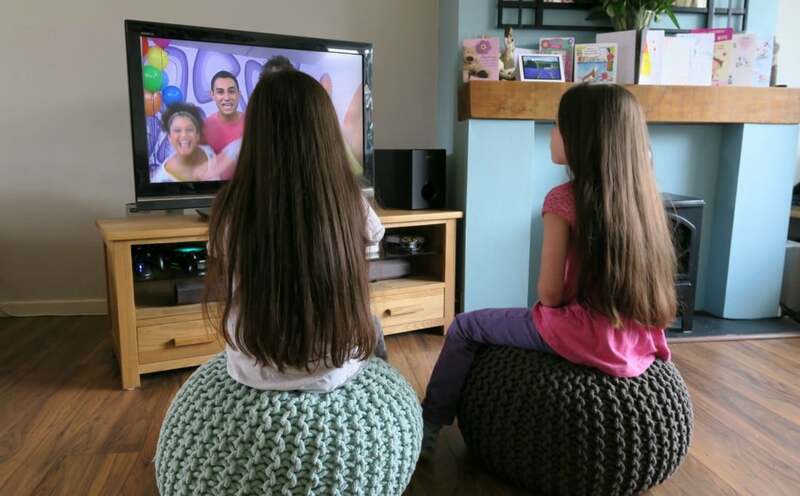 I am really pleased with these pouffes, the quality is great and they will see a lot of use I am sure. The colours work great with the yellows and blues, so the colour wheel worked! What do you think of the colour wheel? Would it be something that would help you come up with a colour scheme for your house? *I was sent these pouffes for the purpose of this post. However all words are honest and of my own. 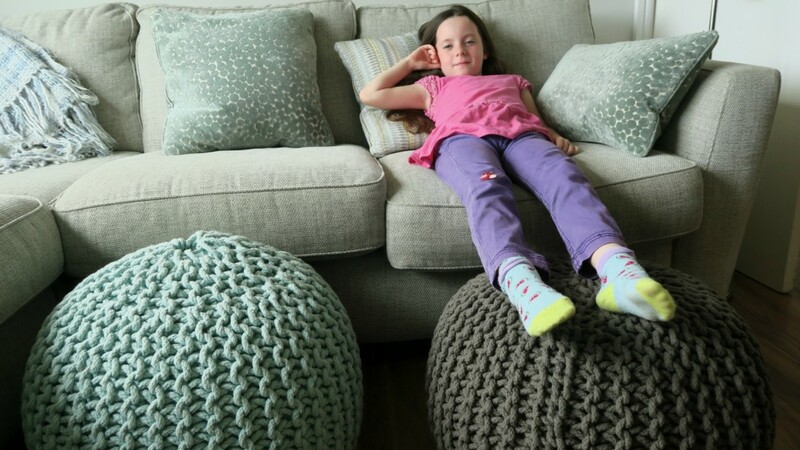 The pouffes look very comfy, loving the chunky knitted accessories at the minute, getting in the cosy mood ready for the cooler months. I love that colour selecting tool – I’m really bad with matching colours so this is ideal for me! I love the George colour selector and used it to style our bedroom. It’s fabulous. The look so comfy and match the colours in your living room to perfection, I have pouffe envy! Such handy tool I love the look of the pouffes especially the turquoise one. They compliment your room well.